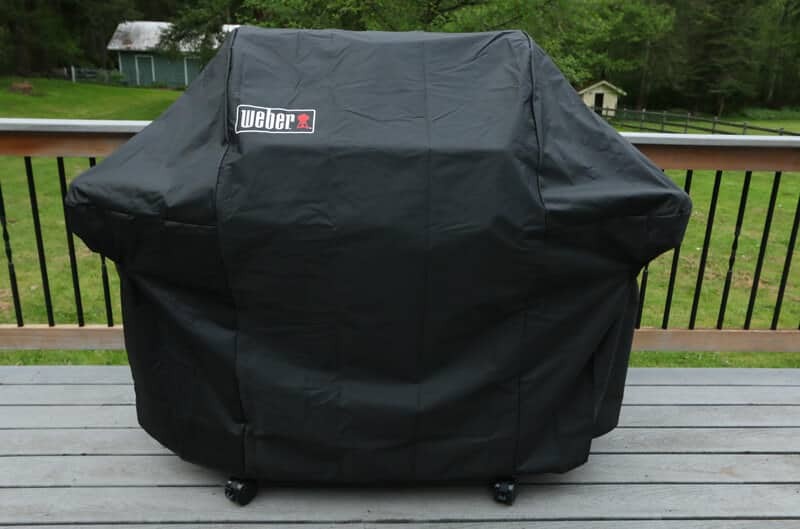 I’ve teamed up with Weber to bring you this post! I can’t even tell you how done I am with rickety grills. We’ve gone through two of them in the last 5 years and it’s one of those hard lessons learned: You end up paying more for cheap quality items because you have to replace them continually. It’s better to go with quality in the first place because it saves you money in the long run. And it makes the experience vastly more enjoyable. Up until now I’ve always been the cook behind the grill. My husband’s never really been interested. And I can’t blame him because really, cooking on a mediocre grill is, well, less than exciting. In fact it’s utterly lame. But guess who was as excited as a boy on Christmas morning when our grill arrived? That’s right. Everything changed as soon as we got our new Weber grill. All of his masculine grilling instincts suddenly kicked in. 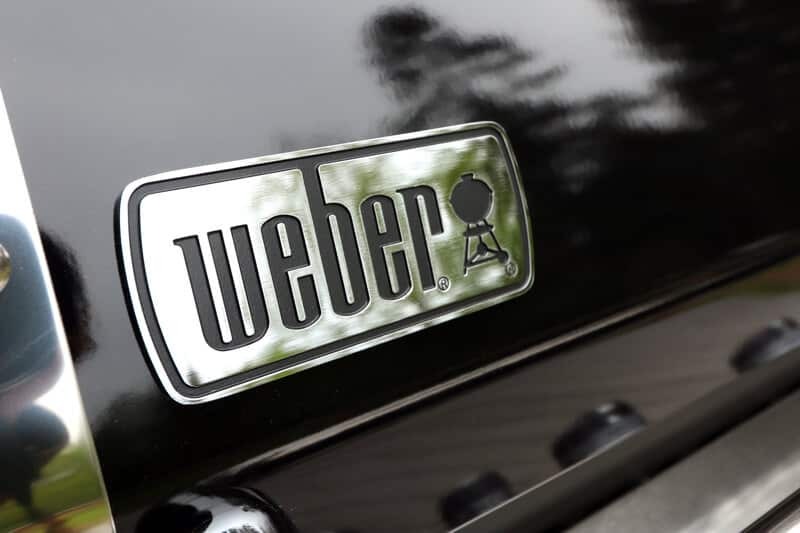 Weber is the gold standard in grills. 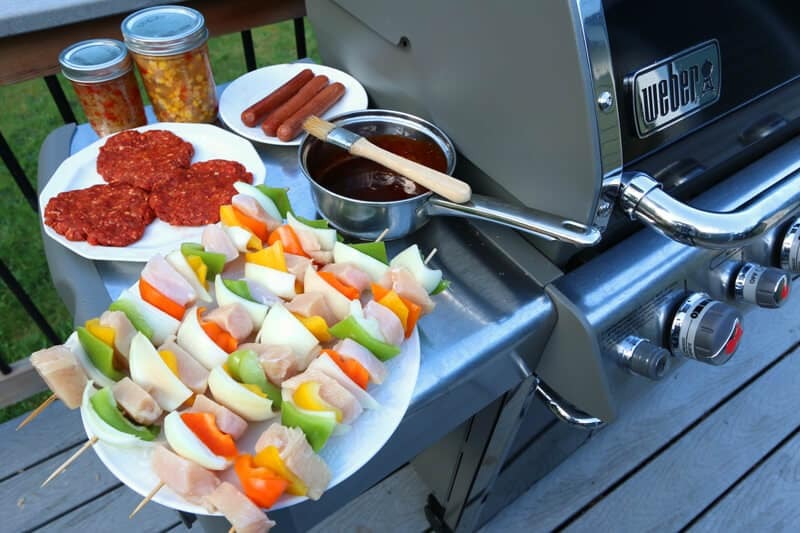 They’re one of the oldest manufactures of grills in America and with their attention to detail, quality and unparalleled customer service, they produce some of the most respected BBQ equipment in the world. 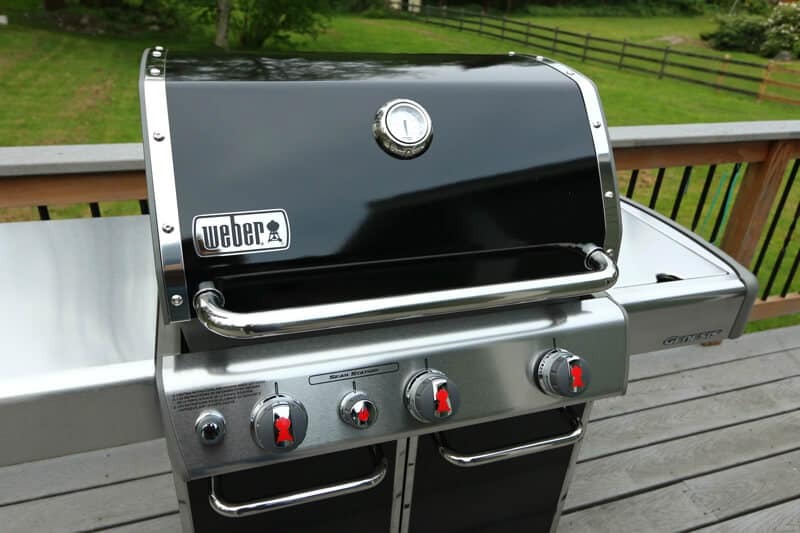 Weber was our first choice when it came time to select a grill. With quality also comes a higher price tag. Weber grills aren’t cheap. But neither is their quality. But like I said earlier and something I can’t emphasize enough is that quality ends up saving you money. As with any quality product, it lasts longer. It stays looking good longer. And it’s much more enjoyable to use. We wanted a grill that was large enough to feed a small crowd but not monster-huge. The mid line Genesis EP-330 offered exactly what we were looking for. It’s one of the most popular gas grills in the U.S.. And we couldn’t be happier with our choice. 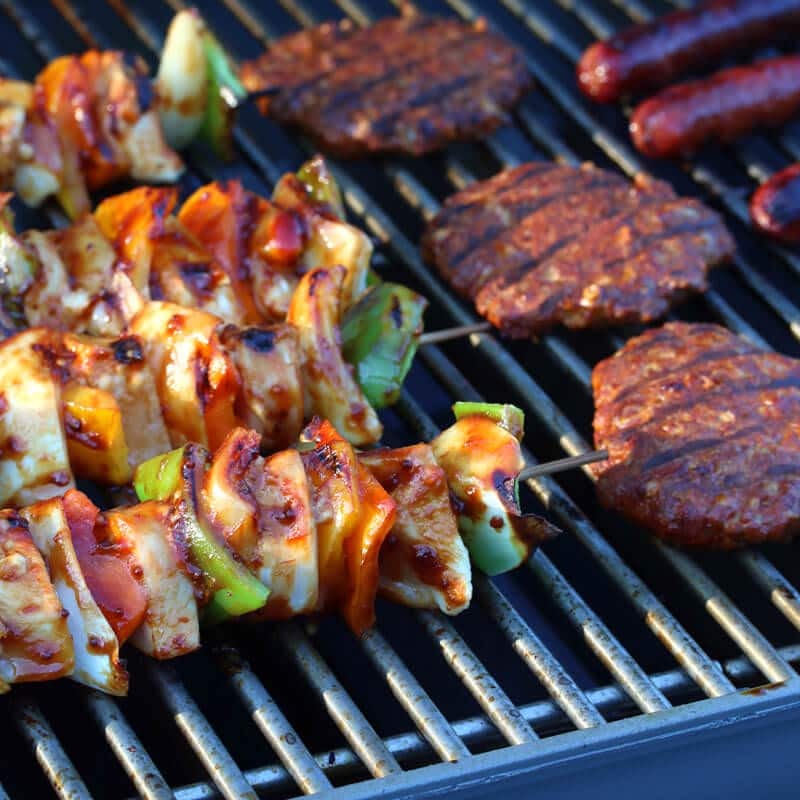 Let’s take a thorough look at the grill, its features and functions, and then…we’ll demo it with some FOOD using one of Weber’s own recipes, a Locomotion Barbecue Sauce that will get your taste buds moving! The Genesis line comes in the 310 and 330 series, the 330 offering the addition of the Sear Station. The 330 line comes in S, E and EP models. The S model comes with a fully stainless steel exterior whereas the E and EP models come with porcelain enameled steel exteriors like ours below. As nice as stainless steel looks, we specifically chose the porcelain enameled model because, like stainless steel kitchen appliances, they’re difficult to keep looking clean – especially with small kids on the loose! Color options include black, copper and green. And they still have lots of nice stainless steel accents. It’s a gorgeous grill and its construction quality is exceptional. One of the things that impressed me when we were looking at this grill in the store was how heavy-duty the lid was. The next time you’re in the hardware store, compare the various brands by lifting up the lids. You’ll notice a major difference. No other grill is as heavy or sturdy. You can tell it’s not only built to perform, it’s built to last. And it comes with a 10 year warranty. The Genesis 330 line features a front-mounted control panel. 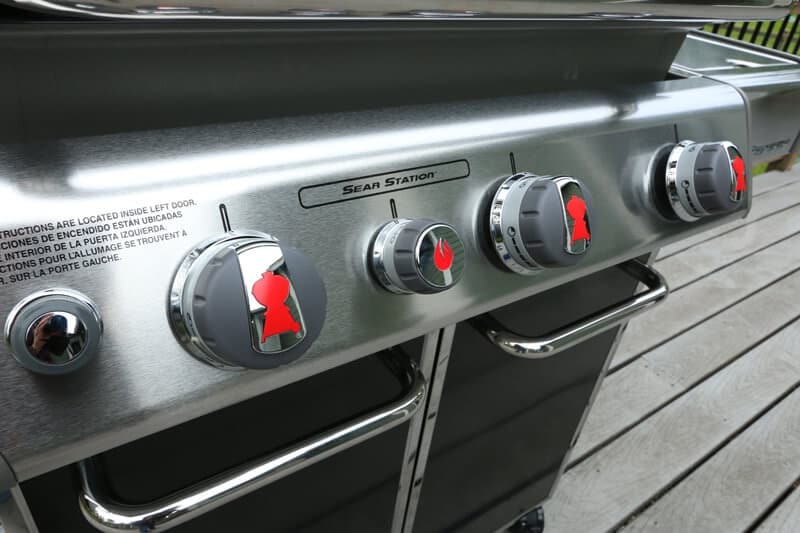 The Weber symbol on the knobs indicates whether the grill is turned on or off, but Weber recently added an additional feature: The knobs also pop out when you turn them all the way to off. It’s a nice feature to avoid accidentally leaving the grill on. 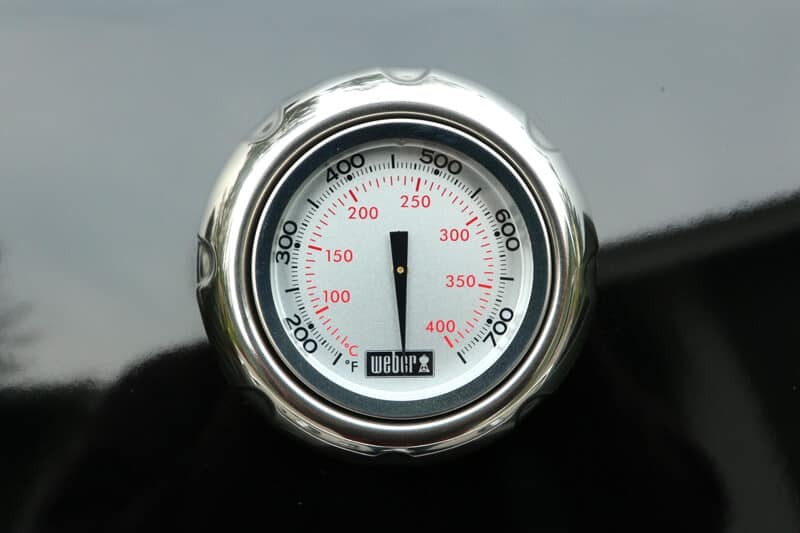 With the Sear Station feature on, this grill cranks up to 800 degrees F – that’s hotter than hades! 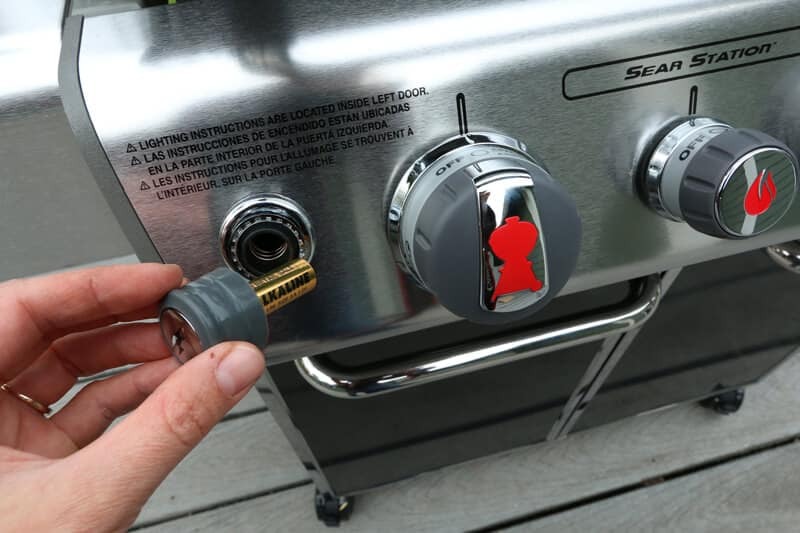 The grill has an electronic ignitor that pulls out to reveal a battery that is easily replaced. Let’s take a look inside the grill. 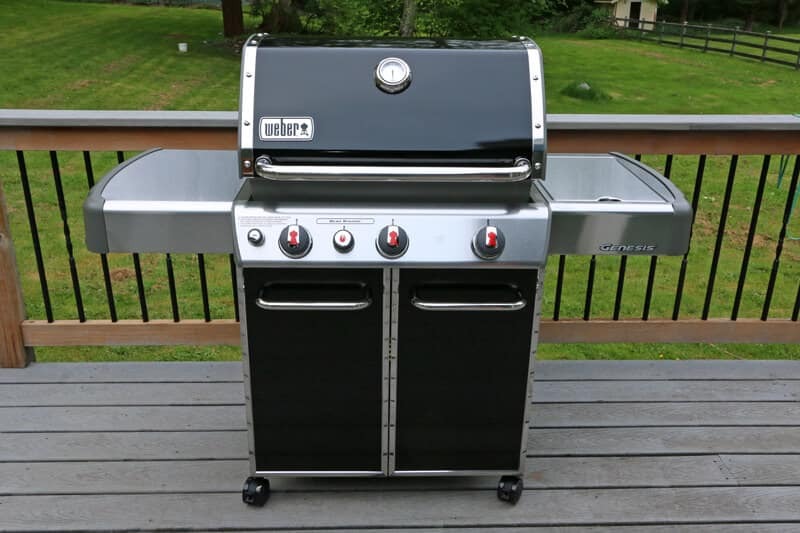 The Weber Genesis EP-330 features stainless steel burners with stainless steel rod cooking grates. The only difference between the “EP” and the “E” models is that the “E” model is slightly less expensive and comes with enameled cast iron cooking grates and flavorizer bars. Which one you choose really comes down to personal preference. Because of the moist weather here in WA we went with the stainless steel cooking grates to make cleanup easier and to prevent rusting once the enamel coating eventually wears off. The main burners have a 38,000 BTU-per-hour input. The Sear Station burner has a BTU-per-hour input of 10,000. 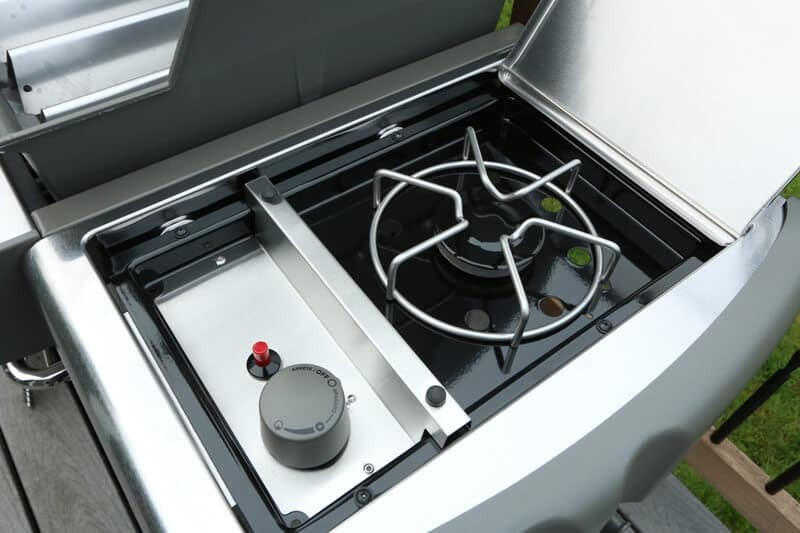 The Genesis boasts a generous 637 sq in total cooking area with a 130 sq in warming rack. 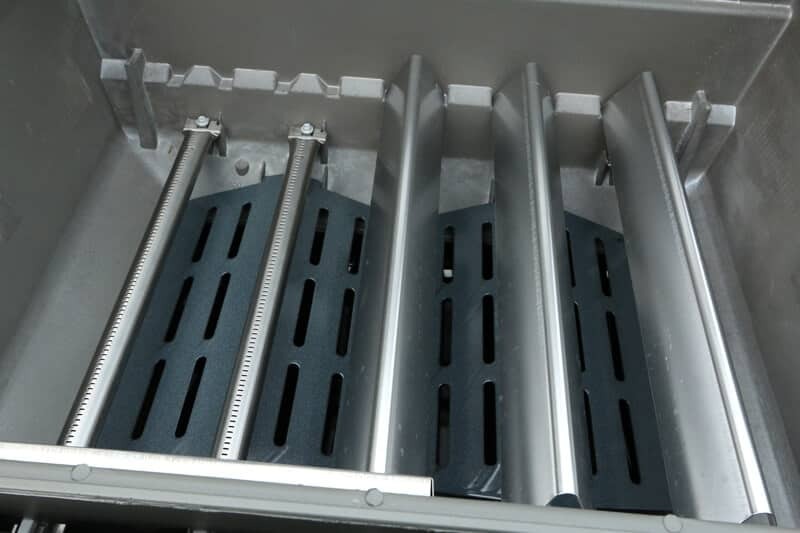 Underneath the cooking grates are stainless steel burners and each one is covered by a V-shaped Flavorizer Bar that both protect the burners while also vaporizing the food drips to further infuse the meat with flavor. 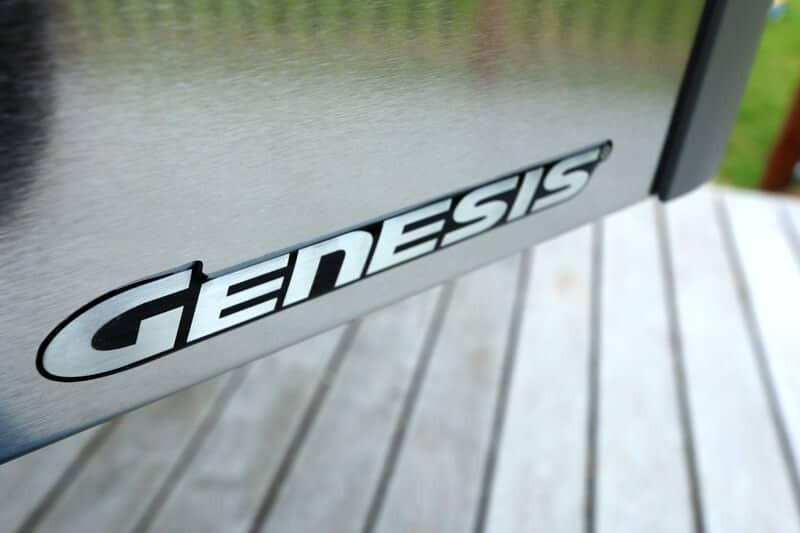 The Genesis also comes with a side burner with a 12,000 BTU-per-hour input. Boil some corn, saute some mushrooms or peppers, however you want to use it. The Genesis features a painted enclosed steel cabinet with painted steel doors and stainless steel handles. 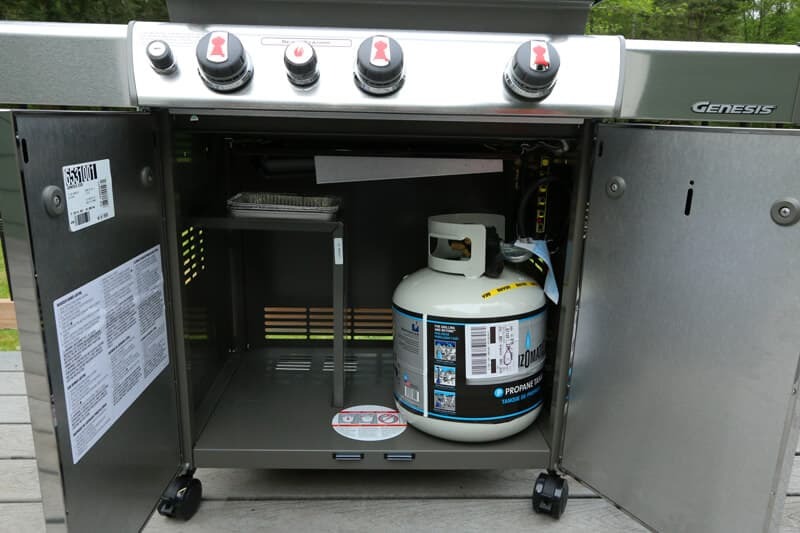 The grill offers easy front access to the gas tank (if you’re using propane) and to the grease tray and catch pan. Just above-right of the propane tank is a neat feature, a Precision Fuel Gauge, that lets you know the fuel level without having to remove it. The Genesis 330 line is also available for natural gas hookup. The grill sits on lockable casters that are very sturdy. 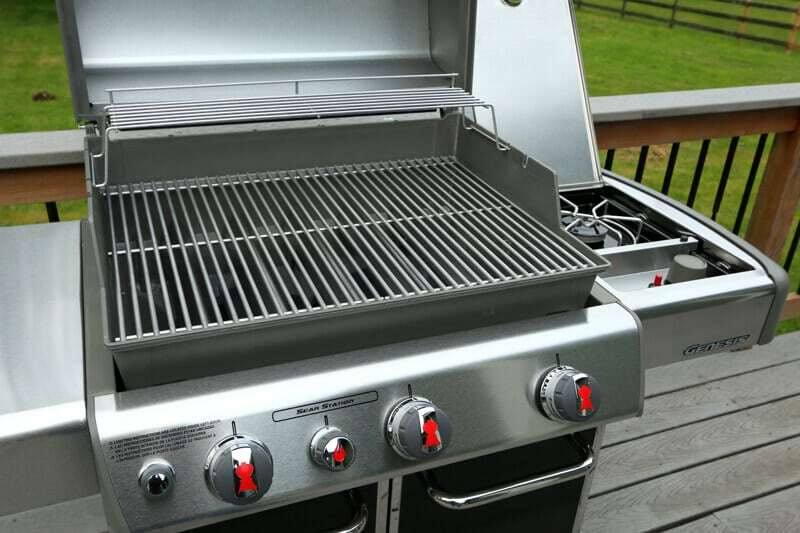 A fitted cover is also available to protect the grill from the natural elements. Okay, time to put this baby to the test! 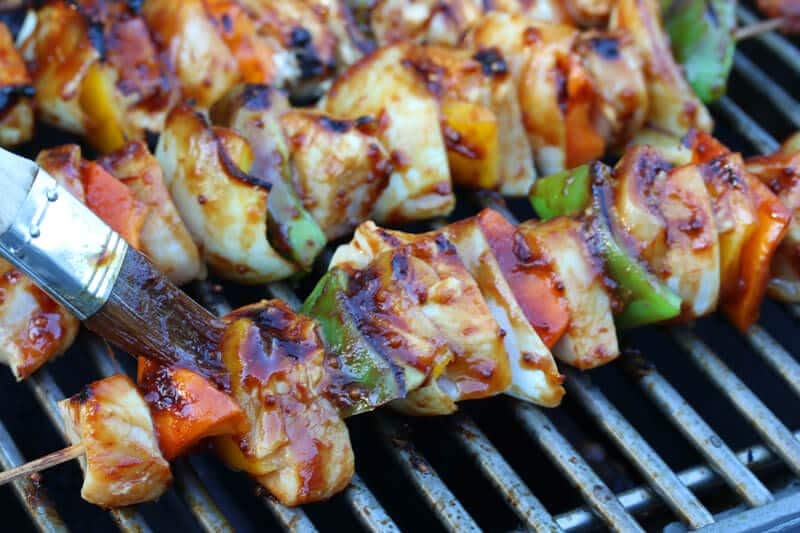 I rounded up a few things to try on the grill: Chicken shish kabobs, burgers and hot dogs. We also tried some baby back ribs (coming up next). For the burgers and dogs I grabbed a jar of my most recent development, a sweet corn relish, as well as my popular Homemade Sweet Pickle Relish. Within minutes the aroma of barbecued food filled the air. 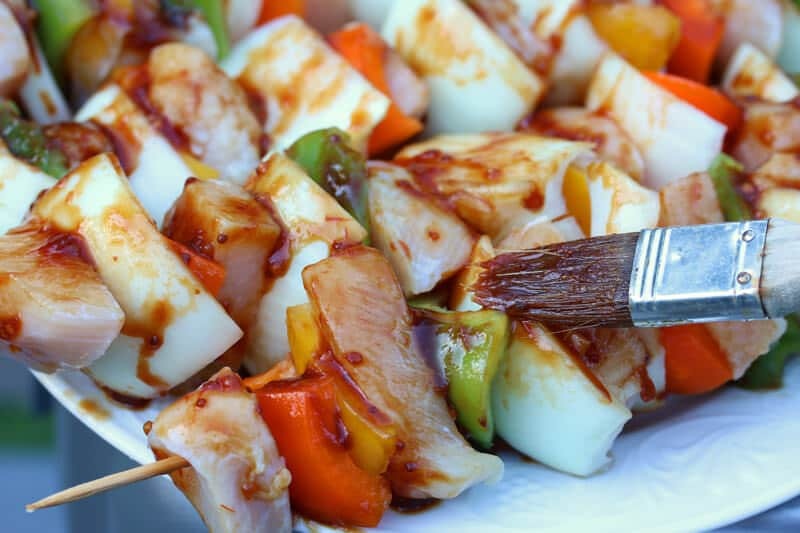 We played outside with our kids, coming back to the grill to flip the kabobs and burgers and baste them with some more sauce. Now how about something Low-and-Slow? For our next grilling session we tried some tender-juicy baby back ribs. Those are hard to beat! 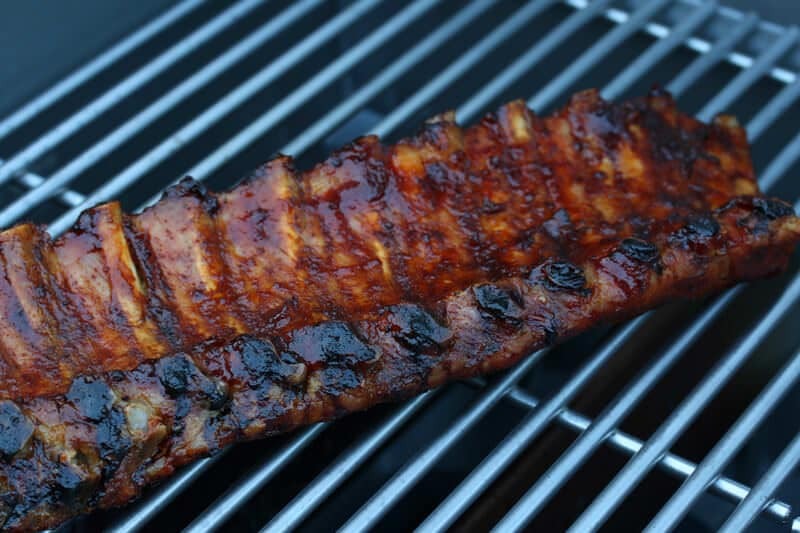 This Locomotion Barbecue Sauce also pairs perfectly with ribs. Bottom line: Do we like the Weber Genesis EP-330? No. Will we get a lot of use out of it? Heck yeah, for many years to come. For a rock-solid, premium-quality workhorse of a grill with all the bells and whistles you need to achieve outstanding results, we highly recommend the Weber Genesis EP-330. Okay, ready for that barbecue sauce recipe? Rich in Kansas City character with a flavor that will get your taste buds moving! Combine all ingredients in a saucepan. Bring to a boil, reduce the heat to medium-high and simmer for 5 minutes. Remove from heat and let cool. Use as you would any barbecue sauce. Pairs especially well with chicken and ribs. Disclosure: I did not receive any monetary compensation to write this review. Weber was kind enough to supply us with a grill to facilitate this article without any obligations to write a positive review. As always, all opinions are entirely my own. Your timing couldn’t have been more perfect. My husband LOVES to grill. I do too but it’s mostly his territory – it’s something he’s proud of and he needs a hobby, lol :) Anyway, we’ve been talking about getting a new grill. I haven’t wanted to splurge on something quite this pricey but I agree with you, quality pays for itself and from what I’ve heard about Weber I suspect it will last for many years. I may just have to surprise him with one of these for Father’s Day :) I’ll let him know you put me up to it! :) Thanks, Kimberly! Cori, I suspect that’ll win you some mighty good points with your husband and it’s a win-win situation: He spends more time with a productive hobby and you get a break from dinner prep – score! Love me some grilled food! :) Great pics! Thanks, Trish! There isn’t much that can beat some great food off the grill, is there? We don’t use our grill much any more. It’s old, and rusty, and I just haven’t wanted grilled food. But maybe if we got something like this one that would change our grilling habits. We don’t need anything quite as fancy as yours, but I agree that it is well worth buying quality. If we went back to grilling it would certainly keep my husband more involved in meal prep (he’s the griller – I never have been any good at it). The BBQ sauce recipe sounds really good, too. YUMMY!! And that is one beautiful grill in a beautiful setting! I bought my husband a Weber Silver many years ago.He would grill all through the winter – actually dig a pathway through the snow on the deck to the grill from the back door. We have since moved and sold the grill with the house. The new owner wanted it that bad! When we got into our new home my husband could not live without another one, so he got another Weber Silver and has been back in business ever since. Saves on the electric bill and we eat healthier as well. Great article, Kimberly. Thank you for the BBQ sauce recipe. Hi Alice, I love that image of your husband digging that pathway through the snow to get to the grill! :) That’s classic! 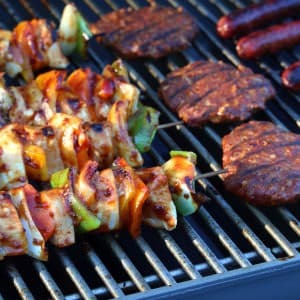 Looks awesome – the food and the grill!! Woah!! Those kabobs look goooood and I want the recipe to those RIBS too!! Gorgeous grill, my dad has been using his Weber for years and swears by it. Hi Kimberly, just as a side note, my husband mentioned that you might want to put a grill mat on your deck, under the grill. It might not look the best but we used to have one and it helped. I agree, beautiful setting….and food of course! Alice, you are so right. We didn’t have one in time for this post but do need to get one – thanks for the reminder! Congratulations on your Weber grill! I’ve had my Genesis Silver for 14 years now and it’s still going strong. I’m getting ready to replace the flavorizer bars and racks. Notice you have the stainless steel flavorizer bars. Those are definitely the right choice. The porcelain enameled steel accessories don’t last for more than 4 or 5 years. 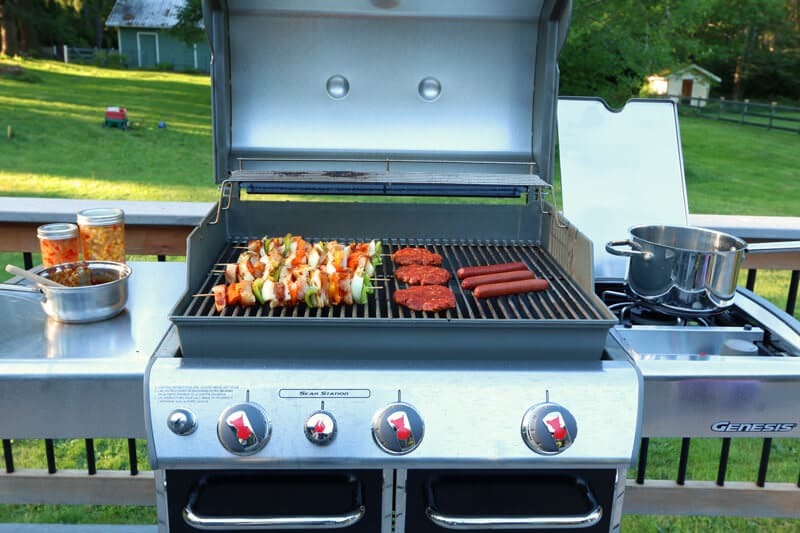 The one thing I recommend–for you, it will be the next time you invest in a grill–is to buy the Webers that allow for a permanent gas connection. I’ve had that feature on my Webers for 30 years and swear by it. When I moved into my present home 14 years ago, I had a gas line run out to the deck for the grill. Cost me $150–a fraction of what 14 years of gas canisters would have cost–and the grill heat is never limited by the capacity of the canister. Looking forward to trying your barbecue sauce soon. It’s funny, Maris, because we tend to eat far more veggies when we grill than we otherwise do – it’s just so darned convenient to throw a bunch of them on the grill and they taste so good! I am absolutely blown away by this grill. This is on my shopping list! I live the the great southwest and my grilling season is just about to start. It just need to drop about 10 more degrees. :) I am vegan but you won’t believe how much can be grilled. I even put my iron skillets on there. There are also so many aluminum packet meals that can be grilled. Skewered veggie combos like crazy too. You can tell I am excited! Ginny, it’s so true about how versatile it is! And during grilling season we generally eat way more veggies than we normally do because it’s such an easy, fun and delicious way to eat them! This sauce looks wonderful. I so much prefer homemade BBQ Sauce to bottled! Oh, me too, Carol! Plus it doesn’t have any junk ingredients in it like high fructose corn syrup, preservatives and who knows what else! I’m pretty sure I could slather this sauce over everything. Looks SO tasty. This grill looks pretty legit too. If we didn’t already have a weber (that we love! ), I would get this one. We love our Weber, Brandon, and plan on using it for many years to come! Wow, what a beauty of a grill! I would definitely be using it all the time – great sauce you came up with to use with it! This Weber really is drop-dead gorgeous, Anita! 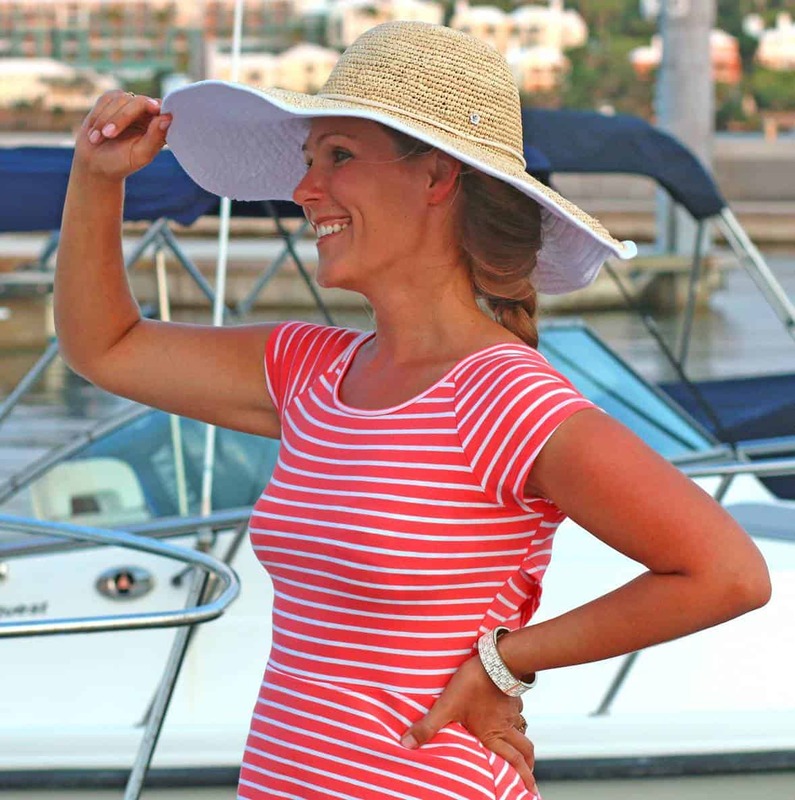 We’ve been using it all Summer and absolutely love it! I can’t have a grill at my apartment but would take that one if I could! I can try the sauce for now at least. Thanks! That grill is GORGEOUS!! And I love that BBQ sauce, what a great blend of flavors! Isn’t it, Faith??! We LOVE our grill! Great looking grill! We just redid our patio and put in an outdoor kitchen to fit around our grill. Nothing beat grilling on a nice grill! I think you might be grilling all winter too! For sure, Cynthia! Having a nice grill is definite motivation to get out there and use it often!